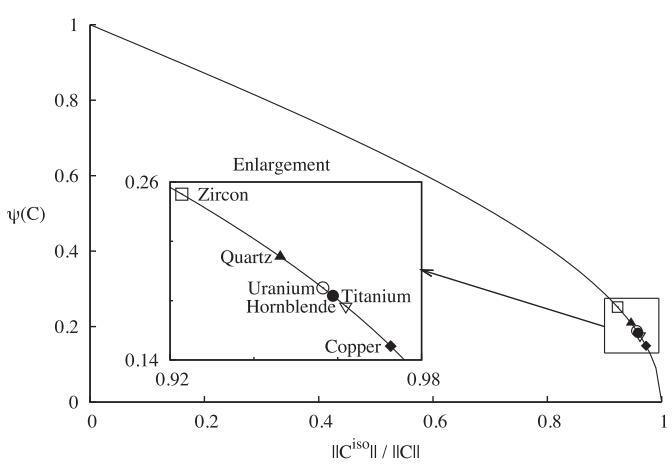 Measure of anisotropy for Zircon, Quartz, Uranium, Titanium, Hornblende, and Copper. In general, thermodynamic admissibility requires isotropic materials develop reversible deformation induced anisotropy (RDIA) in their elastic stiffnesses. Taking the elastic potential for an isotropic material to be a function of the strain invariants, isotropy of the elastic stiffness is possible under distortional loading if and only if the bulk modulus is independent of the strain deviator and the shear modulus is constant. Previous investigations of RDIA have been limited to applications in geomechanics where material non-linearityand large deformations are commonly observed. In the current paper, the degree of RDIA in other materials is investigated. It is found that the resultant anisotropy in materials whose strength does not vary appreciably with pressure, such as metals, is negligible, but in materials whose strength does vary with pressure, the degree of RDIA can be significant. Algorithms for incorporating RDIA in a classical elastic–plastic model are provided. This entry was posted in Abstracts, Projects, Publications, Research and tagged algorithms, constitutive, continuum mechanics, deformation, elastic, geomechanics, large deformation, material, mechanics, metal, plastic, strain. Bookmark the permalink.